Business and marketing are two colors in the same Rubik’s cube that is entrepreneurship. You may create the best-in-class products or services, but it won’t make much of a difference if you don’t have a good marketing strategy in place, to ensure your customers know what you do. To continue, marketing isn’t just limited to spreading awareness about your product or service. It is a tool that is meant to set you apart and well above the competition. It is a tool that makes you as a brand, much more relatable to your consumers, so they remember exactly why they buy from you. As an entrepreneur, you should consider the following marketing strategies, if you haven’t implemented them already. And you thought Facebook’s valuation was big. 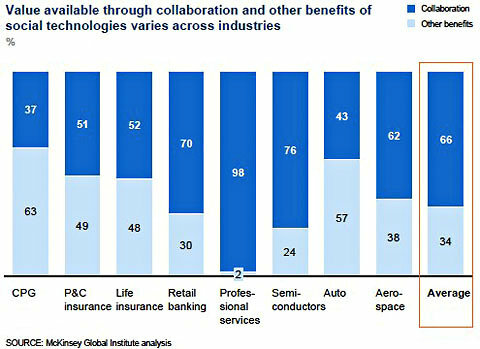 McKinsey Global Institute, the research arm of the business consulting giant, has just published a lengthy study on “unleashing value and productivity through social technologies.” The short version is that things like improved communication and collaboration from social media in four major business sectors could add $900 billion to $1.3 trillion in value to the economy. The value is mostly through added productivity. Improved consumer focus as well as better-functioning teams are two other benefits. That is a great big number, likely to attract attention. McKinsey last did that in May 2011, with a report that said that by 2018 the United States could face a shortfall of 1.5 million data analysts and managers able to cope with the flood of data in their businesses. Nasdaq OMX Group Inc.’s plan to earmark $40 million for brokers whose orders were mishandled in Facebook Inc.’s initial public offering will hurt competition, according to NYSE Euronext. The second-biggest U.S. stock-exchange operator said yesterday that it would pay $13.7 million in cash, with the rest of the money credited through lower trading fees for members who took losses. That step was criticized by the New York Stock Exchange owner, which said it compels customers to trade on Nasdaq to get refunds. The Securities and Exchange Commission must approve Nasdaq’s plan before it can be implemented. Delays and malfunctions on the Nasdaq Stock Market were the first signs of trouble in the May 18 Facebook IPO that burned investors, cost Wall Street market makers an estimated $120 million and prompted lawsuits against the company, its exchange and the underwriters. The stock is down 29 percent since the $16 billion offering, the biggest ever by a technology company. Knight Capital Group Inc. in Jersey City, New Jersey, estimated in a May 23 government filing that it lost as much as $35 million in the IPO. The company is one of the largest wholesalers, a category of market makers that executes orders for individual investors sent to the firm from retail brokers. You know that the hand-wringing over the almost 25 percent drop in the value of Facebook’s Inc.’s stock since its May 17 IPO has reached a new level of disproportion when ABC’s “Good Morning America” weighs in with the idea that maybe Mark Zuckerberg should abandon his honeymoon and return to Silicon Valley to somehow make things better for the gullible investors who got singed. Lots of reasons have been posited for the Facebook IPO “debacle” — as the news media likes to describe it — including that perhaps Zuckerberg, the company’s founder and chief executive officer, and his management team failed to disclose declining quarterly advertising revenue in a timely way. Or that Nasdaq OMX Group Inc. failed to process initial purchase and sale orders properly on IPO day. Or that some underwriters passed “quiet guidance” to big, institutional investors about Facebook’s financial prospects but not to smaller investors. Or that technical “trading glitches” caused the problem. Or that Morgan Stanley (MS), Facebook’s lead underwriter, botched the whole IPO process. Groupon Inc. (GRPN), the largest daily coupon website, declined the most in a month as a lockup period expired, permitting insiders to sell shares. Groupon dropped 8.9 percent to $9.69 at the close in New York. It touched as low as $9.53, the biggest intraday decline since April 30. The coupon site is attempting to rebuild investor confidence after shares fell by half since the November initial public offering, among the worst market debuts for a Web company since the dot-com crash. Groupon’s stock has been battered by earnings restatements and the departure of Starbucks Corp. Chief Executive Officer Howard Schultz from the board, said Jeffrey Houston, an analyst at Barrington Research Associates in Chicago. “All the negative headlines, the market overhang, it’s just kind of coming to fruition,” Houston said in an interview. Groupon generates revenue by selling discounts — known as Groupons — from businesses such as restaurants and nail salons. It shares coupon proceeds with merchants. The company in March reported a “material weakness” in its financial controls and said fourth-quarter results were worse than previously stated because of higher refunds to merchants. That followed a restatement of 2010 results in September because Groupon had counted the total amount of its daily-deal sales as revenue, including fees paid to merchants. NEW YORK, NY, May 31, 2012 (MARKETWIRE via COMTEX) — Social media stocks have fallen sharply recently. The Global X Social Media ETF (SOCL) is down almost 14 percent in the last month. There are currently a total of four social media companies (Facebook, Groupon, Zynga, and Pandora) who have went public in the last year that are trading below their initial IPO price. Five Star Equities examines the outlook for social media stocks and provides equity research on Facebook Inc. FB +5.00% and Pandora Media Inc. P +1.61% . Facebook options began trading Tuesday on the New York Stock Exchange, and will make its debut on the BATS Options Exchange Wednesday. According to an article from the Dow Jones Newswires roughly 365,000 Facebook options had been traded Tuesday, giving the right to buy or sell 36.5 million shares of the stock. “When you see a lot of people buying puts, that may put downward pressure on the stock because of the hedging that market makers have to do,” said Brian Overby, TradeKing senior options analyst. Facebook after Tuesday trading was worth $79 billion, down from its IPO valuation of $104.1 billion. Five Star Equities releases regular market updates on social media stocks so investors can stay ahead of the crowd and make the best investment decisions to maximize their returns. Take a few minutes to register with us free at http://www.FiveStarEquities.com and get exclusive access to our numerous stock reports and industry newsletters. In this photo illustration, a Facebook logo on a computer screen is seen through a magnifying glass held by a woman in Bern May 19, 2012. Picture taken May 19, 2012. (Reuters) – As the securities industry finally warms up to using social media sites such as Facebook and LinkedIn, regulators are discovering that brokerages and investment advisers are off to a rocky start. Some firms are making major missteps as they ramp up their presence on the sites, and many do not even have social networking policies. Or if they do, many have inadequate guidelines. And while many brokerages and investment advisers were once reluctant to use social media for their work, a growing number find they cannot ignore the marketing opportunity. They are increasingly using social media sites to increase their presence among customers and to recruit new business from investors. A recent survey by the Massachusetts Securities Division found that 44 percent of the state’s investment advisers use at least one social media site. More are expected to use social media within the next year. In this May 11, 2012 file photo, people stand in the lobby of JPMorgan Chase headquarters in New York. JPMorgan Chase accepted the resignation of Ina Drew, its chief investment officer and one of the highest-ranking women on Wall Street after the bank lost $2 billion in a trading blunder. JPMorgan Chase is expected to accept the resignation of one of the highest-ranking women on Wall Streetafter the bank lost $2 billion in a trading blunder, a person familiar with the matter said Sunday. The bank will accept the resignation of Ina Drew, its chief investment officer, the person told The Associated Press, speaking on condition of anonymity because the person was not authorized to discuss the decision publicly. Drew, 55, one of the highest-paid officials at JPMorgan Chase, had offered to resign several times since CEO Jamie Dimon disclosed the trading loss on Thursday, the person said. Pressure built on the bank over the weekend to accept.